OCRA believes that public investments in ovarian cancer research, awareness, and education are critical in the fight against ovarian cancer. OCRA recognizes that instability and uncertainty around funding opportunities slows scientific progress and hamstrings researchers – particularly those early in their careers who depend heavily on grant support. OCRA believes that research into high mortality cancers – like ovarian cancer and others with survival rates of less than 50 percent – should be among the highest-ranking priorities at National Cancer Institute (NCI) and funded accordingly. Despite major advancements in ovarian cancer research and understanding in the past two decades, significant gaps remain. Ovarian cancer involves multiple layers of complexity, which further complicates its diagnosis and treatment. Distinct subtypes exist with different origins, risk factors, genetic mutations, biological behaviors, and prognoses; the progression of each subtype is not fully understood. A 2016 review of the state of science in ovarian cancer by the National Academy of Medicine (formerly the Institute of Medicine) reaffirms that “there remain surprising gaps in the fundamental knowledge about and understanding of ovarian cancer.” Closing these gaps and unraveling the complexities of ovarian cancer depends on ongoing public and private investments in research. As the largest non-governmental funder of ovarian cancer research, OCRA is doing its part. To date, OCRA has awarded over $80 million in private ovarian cancer research to more than 70 leading universities, medical schools, and other research institutions. The federal government distributes ovarian cancer funding through the National Institutes of Health (NIH), which houses National Cancer Institute (NCI), the Centers for Disease Control and Prevention (CDC), and the Department of Defense (DoD). Each agency is unique in its area of focus and grant-making approach but all employ a rigorous peer-review process, ensuring federal investments are meritorious and non-duplicative. Funding levels are determined annually through the congressional appropriations process. OCRA works with its grassroots base of patient and survivor advocates, as well as other similarly aligned organizations to influence congressional decision-making throughout the appropriations process and ensure ovarian cancer programs continue to receive adequate support and funding. The National Cancer Institute (NCI) is the leading federal agency for cancer research and oversees the national cancer research agenda. 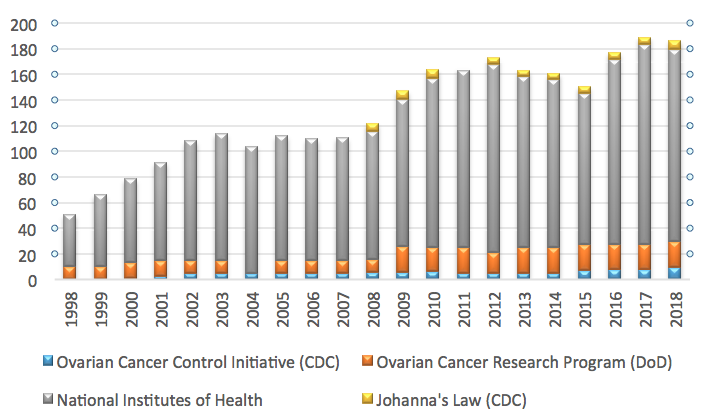 NCI’s investments account for the majority of federal funding for ovarian cancer research and include basic, translational, and clinical biomedical research on myriad topics including early detection, imaging technologies, risk assessment, immunosuppression and novel therapeutic approaches. For the FY2019 appropriations season, OCRA worked with Reps. Rosa DeLauro (D-CT) and Sean Duffy (R-WI), Co-Chairs of the Congressional Ovarian Cancer Caucus, to organize a congressional sign-on letter to House appropriators requesting a $10 million increase in funding for OCRP. A bipartisan group of 121 Members signed on; OCRFA organized a companion letter on the Senate side which garnered more than 20 signatures. In addition, OCRA worked with Reps. Barbara Comstock (R-VA) and Jamie Raskin (D-MD) to organize a congressional sign-on letter requesting appropriations report language asking NCI to address the recent decline in clinical trials for gynecologic cancer A bipartisan group of 29 Members signed on. The Ovarian Cancer Research Program (OCRP) is part of the Department of Defense’s (DoD’s) Congressionally Directed Medical Research Program (CDMRP). OCRP invests in cutting-edge research that’s high-impact, high risk and high reward and may not qualify for funding from other federal agencies. In particular, OCRP focuses on translational research – which aims to “translate” findings in basic research into clinical the patient community. The research pipeline moves slowly and the progression from bench to bedside can take years, or even decades. Translational research is further along in the pipeline and for today’s patient community, offers the best hope for accelerating progress toward long-term survival. Johanna’s Law – also referred to as The Gynecologic Cancer Education Act – was signed into law in 2007 to raise public awareness of gynecologic cancer symptoms and reduce rates of late-stage diagnosis. The legislation is named for Johanna Silver Gordon, who died of ovarian cancer in 2000. Johanna’s Law supports CDC’s Inside Knowledge Campaign, which develops and disseminates fact sheets, brochures, and posters, as well as broadcast, print, and digital public service advertisements to raise awareness of ovarian and other gynecologic cancers. Inside Knowledge uses varied platforms and evidence-based strategies to ensure messaging is effective and reaches target populations. Ads produced for the Inside Knowledge campaign were seen or heard around 6.5 million times and were worth a total of $175 million in donated ad value between 2010 and 2016. Across all of CDC’s cancer pages, the Inside Knowledge and gynecologic cancer pages consistently receive the most visits every month, with the Inside Knowledge home page receiving over 500,000 page views in 2016. Throughout 2016, Inside Knowledge supported a consistent level of targeted paid outreach via digital display, Facebook, and YouTube ads. During 2016, the display and Facebook ads generated more than 300,000 clicks to the campaign website and related pages. YouTube ads generated more than 1.9 million, with an average view-rate of nearly 20 percent. Johanna’s Law also supports ongoing education about gynecologic cancers and symptom among health care providers and offers free Gynecologic Cancer Curriculum for Continuing Medication Education (CME) credits. CDC’s Ovarian Cancer Control Initiative (OCCI) CDC monitors demographic and other factors at the population-level around ovarian cancer diagnosis, treatment, and survival. These include patient knowledge, perceived risk, treatment and decision-making, as well as physician awareness of and adherence to guidelines regarding clinical assessment and treatment of ovarian cancer. This information is then used to inform strategies for population screening and risk reduction.